George R. Blumenthal is UC Santa Cruz’s 10th chancellor. He joined the campus in 1972 as a professor of astronomy and astrophysics. He was named chancellor on September 19, 2007 after serving as acting chancellor for 14 months (July 14, 2006-September 18, 2007). His appointment followed many years as a distinguished professor, researcher, and campus leader; he held several key leadership roles in the University of California system, as well. During 2004-2005, Blumenthal served as chair of the UC Academic Senate. He was faculty representative to the UC Regents from 2003 to 2005, and he chaired the UC Santa Cruz division of the Academic Senate from 2001 to 2003. Earlier, he served as department chair of Astronomy and Astrophysics. In 2010, Blumenthal received the Oliver Johnson Award for Distinguished Leadership in the Academic Senate, the top UC honor for service at both the systemwide and campus levels. Chancellor Blumenthal is well known for his efforts to increase access to the University and for his commitment to diversity among students, staff, and faculty. In 2012, he received the Outstanding Senior Leadership Award from the Council of University of California Staff Assemblies (CUCSA) in recognition of his advocacy on behalf of staff; he has been an honorary member of CUCSA since 2005. Chancellor Blumenthal serves widely on many governing boards in science, technology, and education. In higher education, Chancellor Blumenthal is co-chairman of the Joint Graduate Board of the UC and California State University systems. 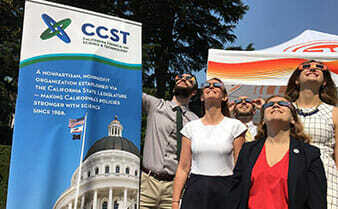 He is vice chairman of the California Association for Research in Astronomy, which oversees the W. M. Keck Observatory on the summit of Mauna Kea, Hawaii, and he is a member of the California Council on Science and Technology. He is also a member of the board of directors of BASIC, the Bay Area Science and Technology Consortium. In Silicon Valley, Chancellor Blumenthal is chairman of University Associates – Silicon Valley LLC and a board member of Joint Venture Silicon Valley and the Silicon Valley Leadership Group; he is also co-chair of SVLG’s Higher Education Task Force. As a theoretical astrophysicist, Chancellor Blumenthal made pathbreaking contributions to our understanding of the origin of structure in the universe, including galaxies and clusters of galaxies, and to the role that dark matter plays in the formation and evolution of this structure. His expertise spans related cosmological issues, such as the generation of density fluctuations during an early inflationary phase of the universe. He has studied gamma-ray bursts, accretion disks, and active galactic nuclei. He is a co-author of the astronomy texts 21st Century Astronomy, now in its fourth edition, and Understanding Our Universe. He is married to Kelly Weisberg, a professor of law at UC Hastings College of the Law in San Francisco. They have two children.